Moto X to follow in iPhone 5's nano-SIM footsteps? Motorola's Moto X could be the next device to sport the new nano-SIM cards, judging by a photo that reportedly leaked out of Hong Kong this week. Engadget today published this photo, which appears to show the Moto X with its nano-SIM tray ejected. Is this the Moto X with its nano-SIM tray? The nano-SIM is 40 percent smaller than the micro-SIM currently used in most devices, so it's easily recognizable, and the phone in the image appears to match up with some previous Moto X leaks. If so, the Moto X will be the third handset, after the iPhone 5 and Asus Padfone Infinity, to adopt nano-SIM. The Padfone Infinity phablet's use of nano-SIM proves that you don't have to be as small as the iPhone 5 to utilize the new, smaller SIM standard. 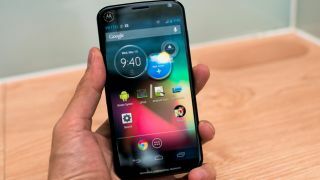 But it's unclear why Motorola would choose to switch to nano-SIM, especially given its opposition to the technology. A coalition formed of Motorola, BlackBerry (still RIM then) and Nokia dueled with Apple over what the next generation of SIM cards would look like, and Apple emerged victorious last year. Nokia said in a statement at the time that Apple's nano-SIM was "technically inferior" to its own tech and even to the existing micro-SIM, and that "the existing micro-SIM (3FF) will continue to be a preferred option for many manufacturers." But if today's leak turns out to be the real deal then it would seem Nokia's former SIM wartime bedfellow, Motorola, disagrees. We won't have to wait much longer to find out for sure: the Moto X launches Aug. 1, and rumor has it the X shipped to carriers yesterday.